Postage Currency (later renamed Fractional Currency was first issued in August 1862.
civil war. There were five seperate issues between 1862 and 1874. 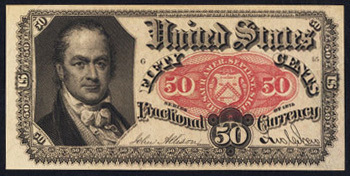 All Fractional notes are collectible today and their are varieties that can be pretty valuable.